Art is a powerful tool for social change. It has the power to change hearts and minds, start movements, and affect real progress in a society. But what happens when that power is wielded irresponsibly, or not at all? That is the central thesis of Ruben Östlund's Palme D'Or winning film, The Square, which examines the unexamined lives of the cultural elite through the eyes of Christian (Claes Bang), a Swedish art museum curator who comes up with a ludicrous concept for an art exhibit designed to make people want to help their fellow man. It's called "The Square," a marked off area on the ground outside the museum, marked with a vague concept statement about equality and sharing responsibility with those who stand inside it. How that applies to reality is up to the viewer, but Christian certainly doesn't understand it better than anyone else, despite lofty pronouncements to the contrary. In fact, Christian is too preoccupied with problems of his own to really pay too much attention to what's going on at his museum. After his phone and wallet are stolen in a staged robbery in the street, Christian tracks the device to a rundown apartment building in an unsavory part of town. His solution? Drop threatening letters in each mailbox in the building and hope for the return of his belongings. It works, but opens up a whole new set of problems as those who have been wrongly accused come looking for retribution. His life is further complicated when his hip young marketing department releases a tone-deaf advertisement for "The Square" in a clueless attempt to generate controversy, blithely ignoring the actual purpose of the piece, causing an equally ridiculous media firestorm. Living in a world designed to comment on reality but never grapple with it directly, Christian's cocoon of privilege completely divorces him from what's actually going on outside it. He pays lip service to bettering humanity and being a responsible citizen of the world, but his art allows him to keep it at a distance rather that participate in it. He sees no irony when he turns away a beggar asking for spare change, only to enlist the man's help to find his lost children minutes later. He expects the lower classes to help him, but when it comes to helping them in turn, he is always full of excuses. The Square is a biting satire of the disconnection of the wealthy elite from the struggles of the lower classes. 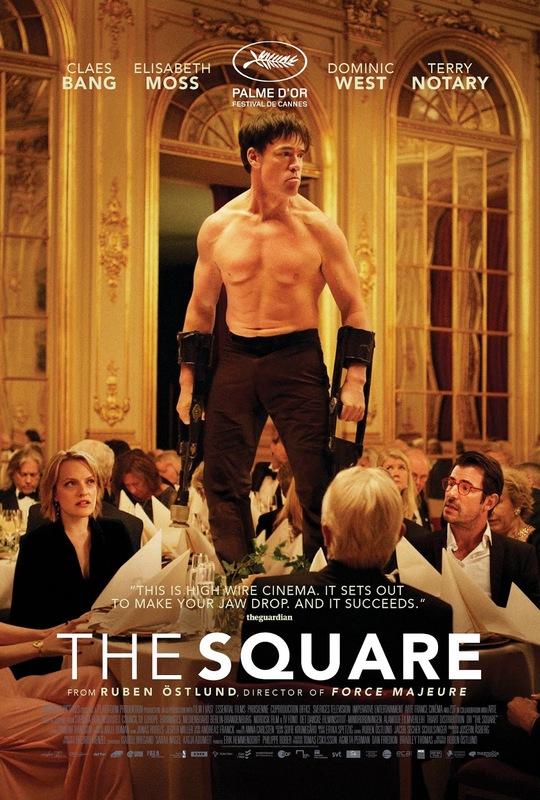 As someone who found the satirical concept of Östlund's last film, Force Majeure, too broad, I was pleasantly surprised by The Square's much sharper focus. It calls to mind Luis Buñuel's 1962 film, The Exterminating Angel, in its ruthlessly absurdist lampooning of the unchecked privilege of the wealthy. But unlike Buñuel's masterpiece, Östlund isn't quite able to stick the landing. By the time Christian finally learns his lesson, he records himself delivering a monologue into his phone (he may as well have been staring directly into the camera) laying out the theme of the film. It's as if Östlund doesn't quite trust his audience enough to get it, and it ends up undercutting the film's thematic power. Still, the film contains two of the most bravura scenes of the year; one involving a hilarious wrestling match over a used condom, and the other featuring motion-capture expert Terry Notary (Kong: Skull Island) as an actor portraying an ape in a ridiculous art installation that goes way too far in attempting to push its audience out of their comfort zones. Östlund is clearly onto something here, but his instinct to generalize often undermines the effectiveness of the final product. I can't help but wonder what a filmmaker like Maren Ade, whose 2016 film Toni Erdmann covers similar satirical territory in a much more subtle style, would do with this material. Östlund has the formal chops, but he just doesn't trust the audience, constantly reinforcing his message with unnecessary affectations. The result is a film that is merely good when it should have been great, insisting on holding our hands and asking "do you get it?" rather than allowing its brilliantly bitter wit to speak for itself. THE SQUARE | Directed by Ruben Östlund | Stars Claes Bang, Elisabeth Moss, Dominic West, Terry Notary, Christopher Læssø, Marina Schiptjenko, Sofie Hamilton | Rated R for language, some strong sexual content, and brief violence | In Swedish w/English subtitles | Now playing in select cities nationwide.